This article is part of UnNews, your source for up-to-the-minute misinformation. WASHINGTON, DC — Robert Mueller, Special Prosecutor in the investigation into Russian interference in the 2016 U.S. Presidential elections, has turned over his long awaited report to Attorney General William Barr. Initial excitement among Democratic lawmakers and political pundits gave way to sheer disappointment and near catatonia, following a leak of the document from an anonymous source in the Department of Justice. 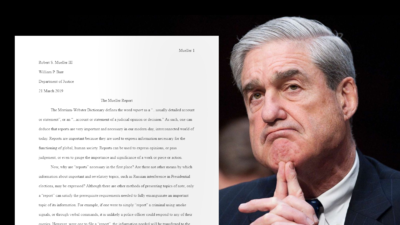 The Mueller Report, previously thought to be a comprehensive, detailed report on Donald Trump's links to the Russian government, has been revealed to merely be a 500-word essay on the importance of the word "report", apparently written on the 21st of March. Republican lawmakers are celebrating the lackluster report reveal, interpreting it as an exoneration of Trump and his Presidency. Mitch McConnell was reportedly seen eating a large bowl of Arugula salad in celebration. Following the news, Donald Trump posted a tweet stating, "NO COLLUSION", before publicly revealing the nuclear launch codes via Twitter.